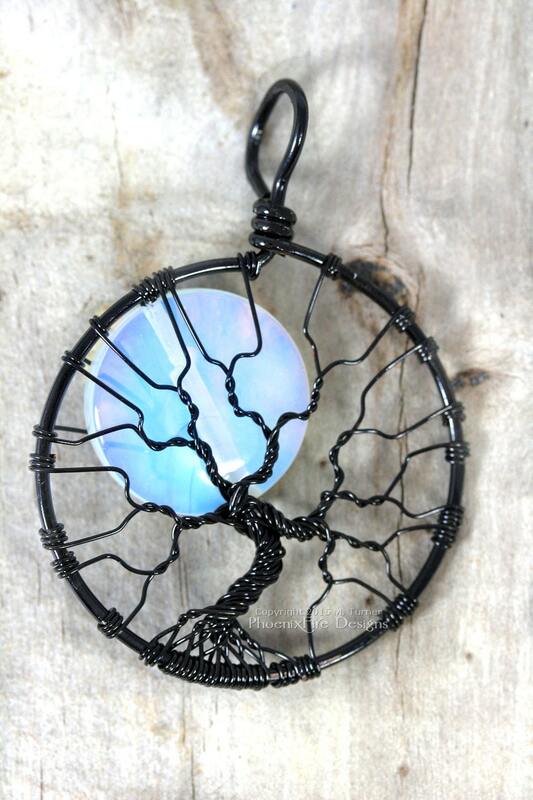 This Celestial Jewelry, Halloween inspired Full Moon Tree of Life Pendant features a beautiful Opalite Rainbow Moonstone "moon" peeking out between wire wrapped bare tree branches. 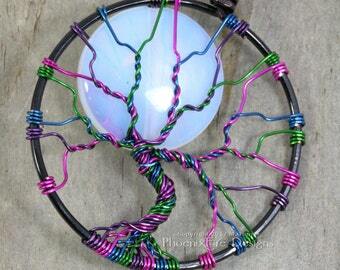 Permanently colored black wire (over copper core) frames and encircles the pendant, and is then used as the roots, trunk and branches of the tree. This tree is bare of leaves like one would see in late Autumn or Winter and features a large, rainbow moonstone "full moon" behind the branches. 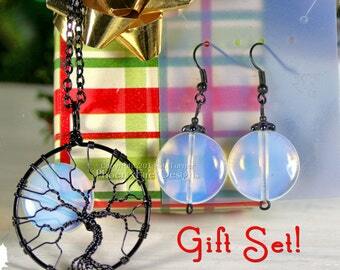 Opalite - also known as "sea opal" - is a rainbow moonstone simulant. It's a manmade gemstone with the look of an opal or a rainbow moonstone. It's a milky white color with extremely beautiful luminous glow ranging from blues (like a moonstone) to an orange type color (like an opal.) You can get perfect form and significant size from opalite, where it's simply not possible to obtain in a natural stone. It also has the added value of being a more affordable option with all the beautiful look and appeal of moonstone. Whether as a gift, or for yourself, this, unique, signature piece would be a great addition to anyone's jewelry collection and a subtle way to celebrate Halloween all year long! Want this customized? Just convo me! I am always glad to make unique items on request. The Tree of Life is known by many names such as the Tree of Knowledge of Good and Evil from the Garden of Eden; Yggdrasil, World Ash Tree, Odin's Gallows, Thor's Oak; Axis Mundi, the Navel of the World, the bridge between Heaven and Earth, the Cosmic Tree, Ashwath Vriksha or Banyan Tree, Jian tree, Sacred Fig, Bodhi Tree - all of these are representations of the same theme. From Norse mythology, to Christian, Gnostic, Jewish and Hindu religions and traditions the Tree is also found in sacred texts including the Kabbalah, and dates back to pre-Christian myths of Germanic and other European people. The imagery appears in myths of Russia, Greece, China and more! It's truly a universal symbol. Or looking for Trees made from birthstones? 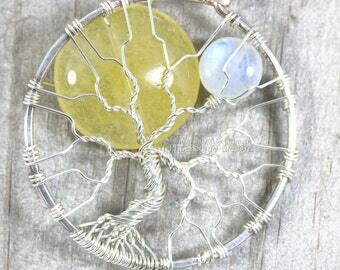 I love my piece of jewelry with the moonstone and the tree of life. I wear it often.